It's a new comic? What the heck is going on?!?! Is it the end times? Are Obama and Trump secretly lovers who just announced that they're the king and uh.... king of the US? That's great for gay civil rights but terrible for the economy! No, I just felt like making a comic. Nobody reads it anyway, so I just decided to draw when I'm not busy feeding my cat. These things take me an absurdly long time to produce. I spent two hours on the rope in the third panel, which just turns into a macaroni blob anyway when I resized the image. I always fantasize that some day I'll print all these comics in a big glorious book that folks will show their friends and say, "see? I'm cultured!" And their friends will say, "wow, that rope is amazing!" But then, anyone who would actually place a Fuzzy & OJ book on their coffee table is unlikely to have friends. Or to own a coffee table. I have a few comics hanging in my cubicle (I briefly considered lying and saying office). None of them are my comics. I don't want to get fired. I think I've made maybe one comic with kittens in it, but even that one has the word "assholes" in it, and I've gotten in trouble before for wearing a t-shirt to work that says "I <3 hot moms". I'm not going to rock the boat. The pirate boat! Speaking of today's comic. 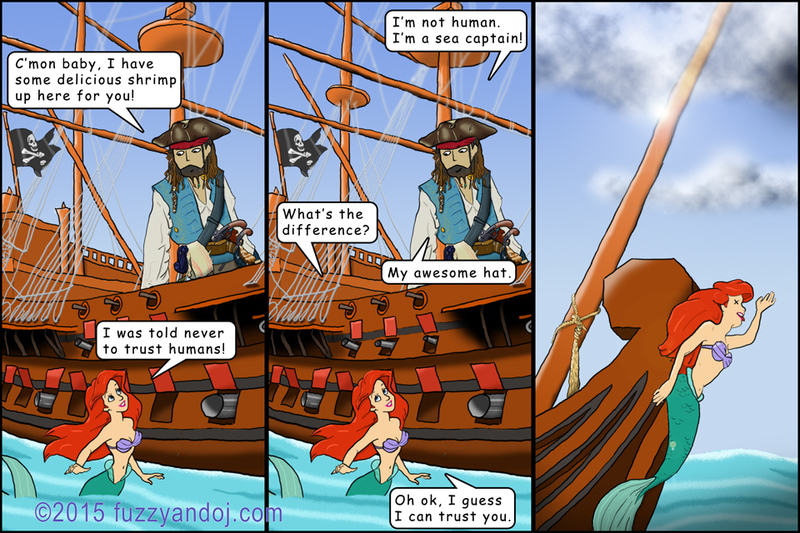 This isn't the first time I've had this particular mermaid in a comic. It's been.... 6, 7 years since the last time she made a showing? She died a horrible death in that one as well. Yes, I know she shares a striking resemblance with a certain Disney® character. It's not because I have a fetish or a basement full of ill-begotten children. It's because she's easy to trace. My presence online is pretty, erm, public. So, no prisoners! Just a lack of artistic skill and general laziness. I think there's been one time so far that someone's done a thorough enough "background check" on me to ask, "soooo, tell me about this comic of yours." Thankfully it was a first date (not a job interview), and oddly there was a second. But it capped off at four, I recall, so I guess she didn't find the comic that hilarious.